Dr. Andersen has participated in numerous contact lens and solution studies. Her research in optometry school was related to determining the amount of protein in the tear film layer during times of stress. She particularly enjoys helping patients with dry eyes achieve some degree of success in wearing contact lenses. Her office offers several new technologies for treating dry eye including Lipiflow and Nulids. Dr. Andersen takes pride in offering the latest technology in disease detection. She purchased a scanning laser in 2007, which was instrumental in detecting several macular holes and numerous cases of glaucoma. Dr. Andersen was the first Optometrist in the nation to offer CIMT, Carotid Artery Intima Thickness ultrasound in detecting cardiovascular disease in her patients. Not only can she and her associates look to see damage to blood vessels in the retina, now they can look for atherosclerosis and placques, potentially damaging the heart. These changes are reversible and Dr. Andersen is able to give her patients a report card with nutritional information designed to educate and create positive change for a healthier lifestyle. For more information, view the Carotid Artery video. 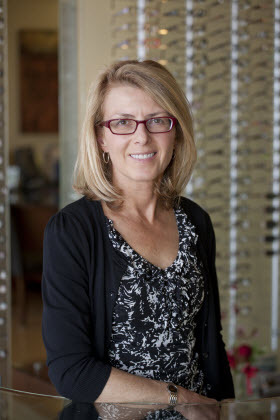 Dr. Andersen donates eyewear to numerous charities around the world that promote education.